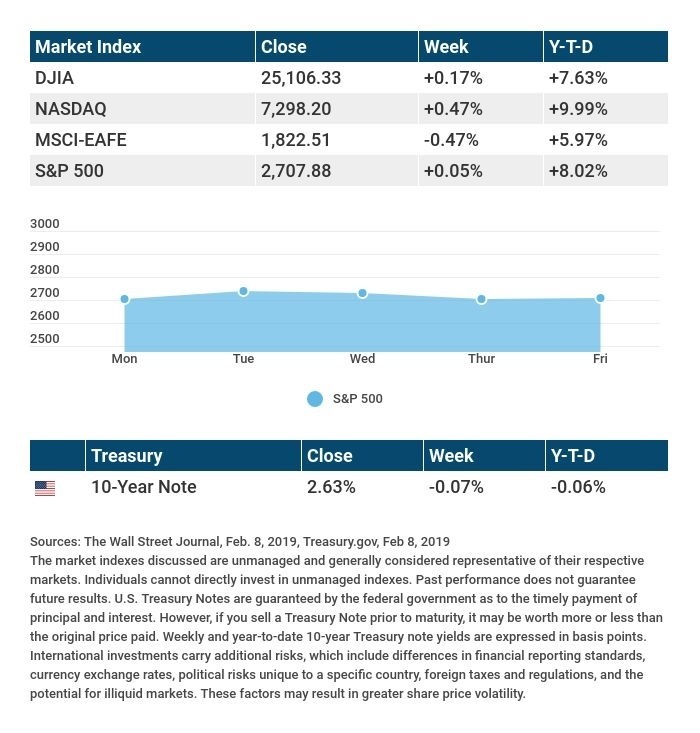 February 11, 2019 - Stocks Post Small Weekly Gains | Legacy Financial Advisors, Inc. The decision by the U.S. on new tariffs may hinge on how much progress has been made toward a new agreement. We don't expect that to become clear until the deadline nears. Over the next several weeks, we're expecting more volatility as the markets digest economic news, a new wave of corporate earnings, and twists and turns on the geopolitical front. We will be watching to see if anything changes our short-term and long-term view. If you have any questions, don't hesitate to contact us. Wednesday: January's Consumer Price Index, which measures monthly and yearly inflation. Friday: January's preliminary University of Michigan consumer sentiment index, a gauge of consumer confidence levels.